Airborne particles also known as “Fugitive Dust”, present many health and environmental risks including respiratory, eye and skin problems. The EPA classifies airborne dust as PM-10 (10 microns) which are visible, usually blowing dust and PM-2.5 (2.5 microns), invisible to the eye, but attributable to many health problems with humans and animals. 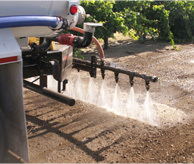 Valley Water Works is owned and operated by Mark Fedorchak, who has extensive experience in the application of agricultural and soil stabilization products for farmers, contractors, rural property owners and site restoration engineers throughout Northern California. Our equipment is maintained in top condition and carefully calibrated to assured the accurate application of the prescribed material. We use ONLY environmentally and animal safe products for controlling dust and soil erosion. Valley Water Works operates D.O.T. safety inspected vehicles that have been specially equipped to handle a wide range of materials and application challenges. These can range from farm and rural access roads to steep hillsides, pedestrian/cart paths and equestrian or motorsports facilities – all sources of major “Fugitive” dust pollution. Our equipment can handle any project from smaller residential needs to the largest commercial or industrial site.